Ahly football club have threatened to withdraw from the Egyptian Premier League if mistakes they allege were made by a referee in their last match are not addressed and prevented from recurring. The Reds were held to a 0-0 draw against El-Entag El-Harby on Sunday in a match that was officiated by Egyptian referee Ibrahim Nour-El-Din; Ahly's management have accused El-Din of committing fatal errors against their team. "The club’s board firmly rejects the rude mistakes of the referee in the El-Entag El-Harby match," Ahly said in an official statement after a board meeting on Monday. "All the experts condemned the referee's mistakes that deprived the team of a deserved win. "We ask the football association to carry out an urgent investigation, to bring things back to normal, in order to complete the competition and also to ensure justice between the competing clubs," the statement added. 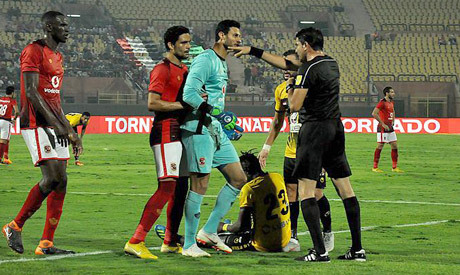 Directly after the match, Ahly's technical staff said the team was denied a clear penalty at the eight-minute mark when Moroccan striker Walid Azaro was wrestled to the ground near the byline. The title-holders also said that they had a goal in the latter stages wrongfully ruled offside, with television replays showing that left-back Ayman Ashraf was onside in the build-up. Moreover, Ahly management stressed that the football governing body should take firm measures to avoid repeating the alleged mistakes in the future, hinting that quitting the league is a possibility. "The EFA should take firm measures to stop repeating these mistakes which threaten the continuation of the competition. They also should reconsider appointing those referees for the coming matches," the Ahly statement read. "The EFA should take its responsibility to develop the current refereeing system by using the latest technological means, including the VAR [video assistant referee]. "FIFA fair play rules also should be applied for the sake of the tournament. "We could withdraw from the league if the EFA doesn’t make strict decisions, even if they asked us to pay the expenses of foreign referees for our matches," the statement concluded. Ahly are currently joint top with 11 points, on level with rivals Pyramids FC who were also held to a 1-1 draw by Smouha earlier on Sunday.